Russia says it will bar Americans guilty of human rights violations, in response to a US bill that targets Russians guilty of such offences. Russian Foreign Minister Sergei Lavrov said he had informed his US counterpart Hillary Clinton of Moscow's decision. "We will bar entry to Americans who are in fact guilty of human rights violations," he said. The US bill, adopted by Congress on Thursday, normalises trade with Russia, but blacklists Russian rights abusers. The legislation passed by large majorities in the House and Senate, and President Barack Obama is expected to sign it into law. Under the bill, the US would withhold visas and freeze financial assets of Russian officials thought to have been involved with human rights violations. The Russian foreign ministry called the bill "a performance in the theatre of the absurd". It warned that the measure would have a "very negative impact on the prospects for bilateral co-operation". "It's strange and wild to hear such claims about human rights addressed to us by politicians of the very state where in the 21st Century torture and the kidnapping of people all over the world were officially legalised," the ministry said. Mr Lavrov announced Moscow's retaliation following talks on the Syria conflict with Mrs Clinton and special envoy Lakhdar Brahimi in Dublin on Thursday. The US trade measure eliminates a long-obsolete 1974 provision, called the Jackson-Vanik Amendment, that tied trade relations with the former Soviet Union to the emigration of Jews and other Soviet minorities. Russia joined the World Trade Organization (WTO) in August, and must open its market and reduce tariffs under the terms of its membership. With the old trade restrictions in place, the US was the only WTO member that could not take advantage of Russia's market reform. However, lingering congressional anger about human rights abuses and anti-American policies helped attach the Magnitsky Act to the larger trade bill. The measure is named after Russian lawyer and whistleblower Sergei Magnitsky, who died in a Russian prison three years ago after allegedly being tortured. 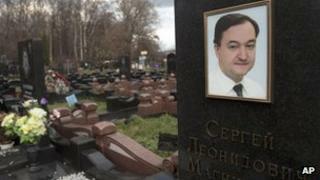 Under the Magnitsky sanctions, the US must release a list of Russian officials thought to have been involved with human rights violations, and deny them visas and freeze their assets. Leading Russian opposition blogger Alexei Navalny, who has long campaigned for transparency, welcomed the proposed US blacklist as a piece of "pro-Russian" legislation. "Our foreign ministry has called this 'a performance in the theatre of the absurd'," he wrote on his blog. "To use another metaphor, I'd call this kind of behaviour by our ministry and officials, who are in horror of these sanctions, 'a fire in a brothel'. "The Magnitsky Act is totally pro-Russian. It aims to punish the scum who stole 5.4bn roubles [£108m; $175m] from Russian taxpayers, transferred the money abroad and then tortured and killed a Russian citizen..."
"It's a shame and an outrage that the USA imposes sanctions on these bandits and butchers, while Russia hides and protects them," the Russian blogger added.